Jeanne Delabar of Beatrice was surprised by the pain in her chest and how uncomfortable she felt after climbing the stairs of the Orpheum Theater in Omaha a year ago. After a week, when that feeling of discomfort didn’t go away she went to the Beatrice Community Hospital Emergency Department and was immediately transferred to Bryan Heart. Jeanne received two stents and was fitted for a “life vest” -- a portable defibrillator. It was now time to begin the next phase of her life. 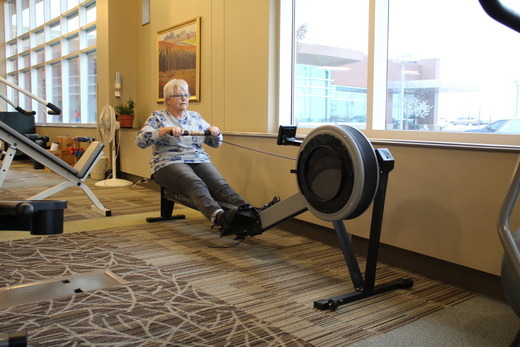 For Jeanne that meant enrolling in the BCH Cardiac Rehab program to regain her heart health and stamina so she could get the “life vest” removed and get back to gardening and participating in family outings. For anyone who has suffered a cardiac event, Cardiac Rehab can provide a safe, monitored environment to help patients regain heart strength and continue to live an active life. February is National Heart Health Month – and Jeanne has a message to share about the number one killer of both men and women in the United States. At the time of her heart attack, Jeanne says she had never known a woman who had suffered a heart attack. Twenty-nine years ago, however, her husband at the age of 45 underwent a five-bypass surgery and was a participant in the BCH Cardiac Rehab program. The two most common symptoms of a heart attack in women are shortness of breath and discomfort between the shoulder blades. For Jeanne, it was pain down the center of her chest. Her husband had no symptoms, just a family history of heart disease which his family doctor knew and monitored. Cardiac Rehab Coordinator Linda Lindell encourages women and men to pay attention to how they feel, and if something just doesn’t feel right to go see a doctor or get themselves to the Emergency Room. For more information on the BCH Cardiac Rehab program, visit http://www.beatricecommunityhospital.com/cardiacrehab or call 402-223-7328.